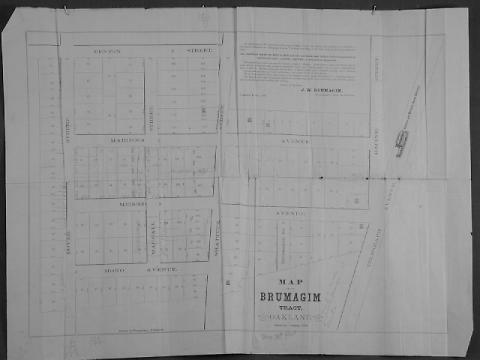 The area shown on the subdivision map is bounded on the west by Dover St. and on the east by Telegraph Ave. (in part) and Racine St. (in part). Mono Ave. is the southern boundary street (probably 57th St.) and Benton St. (probably 60th St.) is the southern border street. 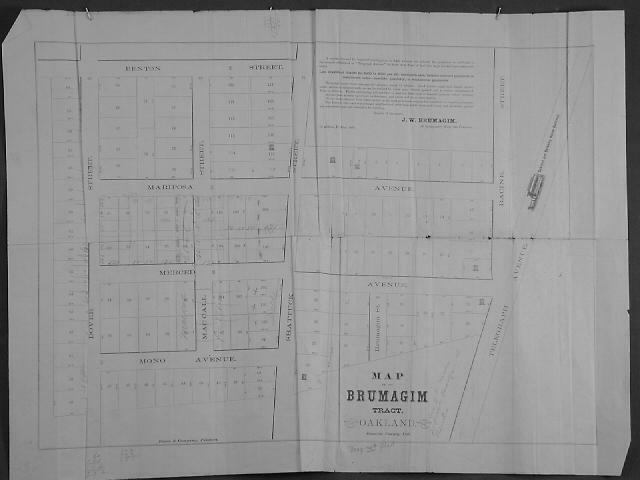 The principle difference between this subdivision map and the one described in H69.38.1671, is that presumably the area shown here is the entire Brumagim Tract, and the other record's map does not include the area from Racine St. to Dover St. "A constant demand for beautiful building lots in shady avenues has induced the proprietor to subdivide in the suburbs of Oakland on 'Telegraph Avenue' his sixty acre tract of land into large lots and upon reasonable terms..."